Should You Include Naps in Your Employee Wellness Program? One of the most important aspects of overall health is often overlooked, and even frowned upon in the workplace: sleep. Sleep is a health concern for the majority of the population. There are countless studies and reports showing the detrimental effects a lack of sleep can cause. Wellsource recently gathered aggregate data from more than 400,000 health risk assessment participants and found that the average American sleeps 6.9 hours a night, just shy of the recommended 7-9 hours for adults. Sleep is crucial to a healthier life; it’s a key factor in reducing the risk of heart disease, stroke, diabetes, and obesity. There’s a correlation between sleep hours and pain. 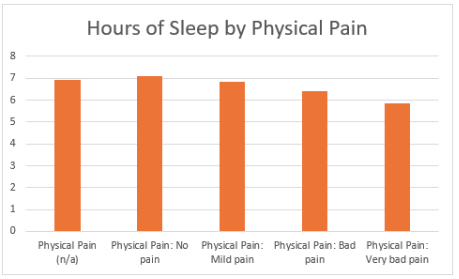 In the Wellsource HRA population, people in the most pain (“very bad”) report sleeping 5.8 hours, on average. Those who report no pain sleep an average of 7 hours. Naps, in particular, can lead to lowered pain sensitivity and regulated appetite. Sleep also affects mental health and happiness. Stress can wreak havoc on employee wellness and overall state of mind. Sleep, however, can prevent, or even reverse, these negative health impacts by significantly boosting mood and reducing stress hormones and anxiety. And it’s backed by numbers. 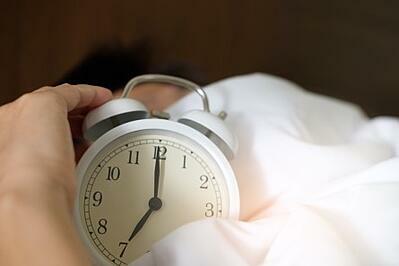 Wellsource found that happy people get an extra hour of sleep every night compared to unhappy people. 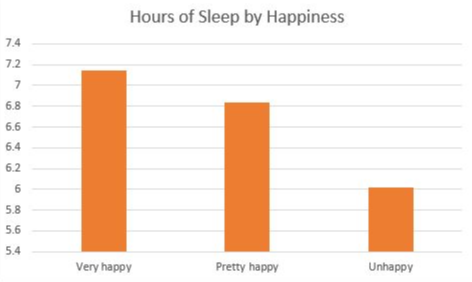 Wellsource data also shows a link between sleep and stress. 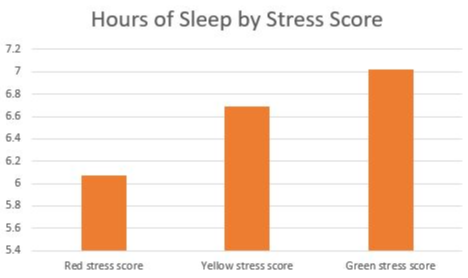 Users with a red stress score (meaning very stressed) slept on average 6.1 hours per night, while those with a green stress score (meaning not stressed) slept an average of 7 hours. Since we know that stress is one of the leading causes of chronic disease (which accounts for a major portion of the more than $3 trillion spent on healthcare in the US) - this data alone may be compelling enough for employers to consider measures to improve employee health in relation to sleep. Aside from the health benefits that naps bring, they can also help save your company money. A lot of money, in fact. U.S. companies lose over $400 billion worth of productivity a year due to sleep-deprived employees. The brain is most dynamic the closest it is to restorative rest. Therefore, a power nap can boost employees’ high-functioning cognitive ability such as problem-solving, reasoning, creativity, memory, and decision-making while maintaining an efficient, accurate output. Many highly-successful companies swear by this tactic, and believe naps are the key to improved employee health, output, and satisfaction. Uber, Google, Huffington Post, Ben & Jerry’s, and Nike are among the organizations that offer nap rooms where employees are encouraged to catch a few minutes of restorative sleep. If you have the space, consider designating a room in your office where employees can catch a few ZZZ’s. Design a quiet space that’s outfitted with comfortable pillows and blankets so your employees can feel enough separation from work to relax. Encourage your employees to take quick 10-20 minute power naps to optimize their energy and workflow. If you can’t swing an entire room dedicated to napping, flex hour availability may be something to consider. With the popularity of new online messaging platforms, this choice is a viable one, allowing employees to run home during lunch to grab a midday snooze, or even adjust their work hours to better fit their sleep schedule. This option maintains production standards while also allowing employees to approach work from a healthier, personalized perspective. Or, simply start an experimental group among employees to find the key to better sleep. Encourage them to turn off screens an hour before bed, limit nighttime snacking, and lower their bedroom temperature to see if they’re able to get higher-quality sleep. Participants can track the methods they use and report their results. Their findings may help the whole office lead healthier, smarter lives. Sleeping on the job may not be such a bad idea. In fact, it might be the best course of action for happier, healthier, and more productive employees. Thinking about designing an employee wellness program around naps? Read this first: Worksite Wellness Programs Best Practices.